There is a strange court case unfolding in England involving the Church of Jesus Christ of Latter Day Saints, commonly called the Mormon church. Two former Mormons using a rarely used legal maneuver have convinced a British judge to issue a summons for Thomas Monson — President of the Mormon church in Salt Lake City, Utah — to appear before London’s Magistrate Court for a hearing on March 14, 2014. The two men allege the Mormon church committed fraud by convincing them to give money to the organization based on false or fraudulent teaching. In the process, the two allege the organization broke England’s Fraud Act of 2006. That Act prohibits the use of false information to gain financial benefit. 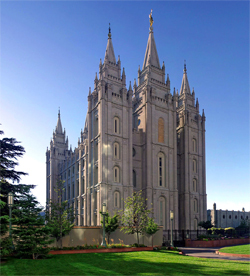 One suit alleges the Mormon church collected $257 million from members in England since 2007. The Mormon’s book of Abraham was translated from an ancient Egyptian papyrus by Joseph Smith. District Judge Elizabeth Roscoe issued the summons demanding Monson appear before the Westminster court to discuss this legal challenge. At this point, the court will then decide if the case will go to trial. If Monson fails to appear on March 14, 2014, an arrest warrant could be issued. The judge’s summons has stunned experts in British law, as England’s secular law does not allow challenges of a Theological nature. The Mormon church has declared this a nonsense suit and stated Monson will not attend the hearing. Joseph Smith started the the Church of Jesus Christ of Latter-day Saints in the 1820 after receiving revelations, visions and an angelic visitation. Evangelicals do not consider Mormons to be part of the Christian faith, due to a number of non Biblical teachings derived from the Book of Mormon and other non Biblical texts. Some Palestinians used a similar strategy in 2009 on Tzipi Livni, Israel’s Justice Minister. That summons caused an international incident. Though this suit only affects the Mormon church, if successful there are concerns similar tactics could be used against Christian churches in attempt to harass and financially challenge them. I agree that this case, if it moves ahead, if even just the summons is successful, creates a precedent that will open the doors to attacks on all churches. The ex-Mormons bringing the claims are not simply ex-Mormons. They do not appear to simply be disaffected members of a church who have taken their faith elsewhere. From all I have read, they appear to be secularist and atheist, and I think they are fully aware (or someone guiding them is) that success in this case will open the doors to attacks on all faith. They are attacking low hanging fruit. They have taken an easy case. The Mormon church has beliefs that are difficult to believe, that are unusual and not accepted by mainstream Christian churches. As a result, they likely believe that they will find allies amongst other faith groups – groups like Evangelical Christians, many of whom have been aggressive (indeed, often very unchristian seeming) in their own attacks on the church. It would be a dangerous thing, though, for other faiths to either to support or simply disregard this case. It would be a good thing for all faiths and churches to support the Mormon church in challenging it. I believe this case is merely a first step in a larger plan that threatens all faiths. Yes, I agree. That is why I posted the article. We need to look at the potential this lawsuit has to affect Evangelical Christians as well. Next PostWas Justin Bieber looking to get water baptized?